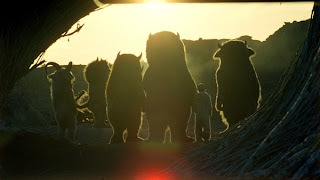 If you're like most kids of our generation, the first buzz of Where the Wild Things Are being made into a feature- length film probably began the build of equal parts excitement and apprehension. Excitement because Maurice Sendak's beloved and eerie children's book was being recreated for us to enjoy all over again; apprehension because it was so perfect - what if Hollywood messed it up? It would be like remembering a careless mistake your parents made at Christmas; didn't Dad have cookie crumbs in his beard that morning as you tore through your bounty? Suddenly Santa died even earlier than you'd previously realized, or worse yet, all over again. Luckily, the magic lives on. Director Spike Jonze (Being John Malkovich, Adaptation), along with writer Dave Eggers (A Heartbreaking Work of Staggering Genius) have combined their tried and tested abilities to turn a 40-something-page book into 140 minutes of cinematic brilliance, that, dare I say, may leave more of an impression than those original 10 lines. Audiences are introduced to the boy of the hour, Max, as he sprints down his household's stairs in the wolf costume that will serve as his second skin throughout the film, chasing his shaggy dog in a fit of growls and yells that leaves you wondering who the animal really is. The work of a hand-held camera makes this opening both jarring and thrilling until Max captures his pet and movement abruptly ceases, traded for a freeze-frame close-up of the ridiculously talented Max Records. The eight-year-old actor quickly exhibits that he was cast for more than his impish face and shared name with Sendak's protagonist. The addition of an adolescent sister, the first of a few successful strays from the original plot, paints the picture of Max as a lonely and imaginative boy, who is as hungry for a playmate to enter his fabricated worlds as he is for a real relationship with his sister, Claire (Pepita Emmerichs), and mother, played to heartwarming perfection by Catherine Keener. An attempt to play with the older boys who are part of Claire's sphere proves that not everyone is ready for Max's far-out visions, demonstrated when the boys carelessly destroy his snow fort. 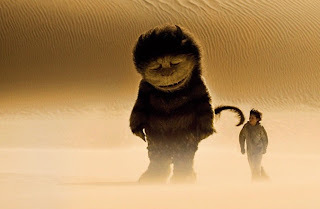 Already wounded, Max's mother's distraction with her boyfriend troubles sends him into the fit that causes him to bite her before running into the night and into the small sailboat that will catapult him towards a tangible impossibility: the island of the Wild Things. A storm provides some serious turbulence before Max is carried to shore by huge waves without a scratch; and yes, the movie is so artfully done that even the complete lack of realism in the human world is acceptable. Upon reaching his new surroundings, the first Thing we encounter is Carol, a lumbering monster whose appearance lies somewhere between a woolly mammoth and Ernie (of the "Sesame Street" franchise). He is in the midst of destroying all of the Wild Things' homes in an emotional maelstrom due to his big baby KW's departure. Immediately the parallels are drawn: Max to Carol, Claire to KW. No one is on Carol's side during this destructive torrent, a feeling Max comprehends all too well, and so he joins him in his hut smashing (though his 4-foot-11-inch frame doesn't quite carry the same punch). A friendship is born. Convincing these colossal inhabitants that he is a king in possession of vast powers beyond their imaginations (though certainly not his), he finds himself not only accepted by but leader of these beings, who are adult apart from their desires and unfettered, childlike nature. This kingship is an ode to the adage that age is, for the most part, only a number, and that most would trade business attire for wolf suits if given the chance. Asked to "keep out the sadness," King Max delivers his first order: "Let the wild rumpus start!" Despite the change of phrase from the book, it certainly is a wild rumpus. Through howling matches, dirt clod fights, pig (monster) piles, and the construction of a hut that puts the snow Max left behind to shame, friends and tensions are formed that ultimately reveal the truth: Max is just a boy, and the Wild Things just need a mother. Where the Wild Things Are is the journey of one boy into a land resembling his imagination and back home again after the discovery that even fantastic creatures need moms, and that the comfort of home eventually trumps the rush of adventure. It is one of those rare movie experiences that inspires the grand spectrum of human emotion, and all to extremes. Jonze and Eggers have managed to create a film universal in its scope without forfeiting an inkling of the eerie charm that distinguishes this children's book from most others. Audiences will laugh, cry, and immediately download the austere soundtrack comprised of original tracks by Karen O (of Yeah Yeah Yeahs) and the Kids. The pressure was on and the band of bold creators behind this film pulled it off and then some, to get entirely cliché: a triumph. Makes me want to see the movie! !